With only 1 unit per floor, it's safe to say 50 E. Chestnut is one of downtown Chicago's most exclusive condo buildings. Situated in an almost perfect location the hovers around Streeterville, River North, AND the Gold Coast, residents here at 50 East Chestnut truly get to experience three of Chicago's best downtown neighborhoods all in one spot. Nearby attractions include Michigan Avenue and the nightlife and dining scene that surrounds Rush and Division, while the lakefront is also just a short walk away from the lobby doors! 50 East Chestnut condos for sale in Chicago offer the highest grade of luxury living right in the heart of Gold Coast, Chicago. See all current listings below. With most condos for sale at 50 E. Chestnut starting at over $2.5 million, you can bet part of the living experience here involves some high-end amenities that make being a part of the 50 East Chestnut community a delight. Once moving in, residents here take advantage of on-site garage parking, 24 hour door service, on-site building management, and a sundeck with exceptional views of downtown Chicago. 50 East Chestnut has 37 full-floor residences, measuring 3900 square feet each. Each unit has its own private elevator foyer and features floor to ceiling windows with 270-degree panoramic views; crown moldings; hardwood floors; stone finishes; custom cabinetry; and two oversized terraces. Advanced technology is built into each home to support music and high definition video. Don't wait to find the condo you've always wanted. 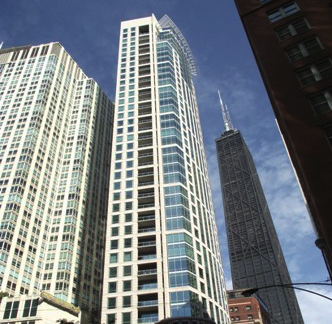 Contact us today and we'll help you find a luxury property at 50 E. Chestnut, Chicago.